The Apple vs. FBI battle has been going on for some time about hacking the iPhone from the San Bernardino terrorist attack. None of us wants to see all iPhones hacked, whether it’s by black hat hackers or legally sanctioned government hackers. At the same time, I doubt even Apple wants to see a missed opportunity to thwart terrorists. 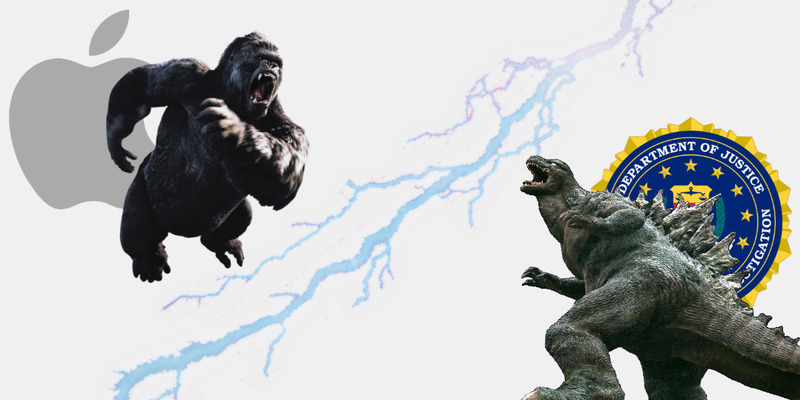 Both sides seem to have turned what ought to be a simple problem into, as the title says, King Kong vs.Godzilla. And the arguments and threats on both sides seem to mostly muddy the issues instead of making things clearer. We’ve had articles on the debate. And I’ve commented on several of them. Some of my thoughts might be worth a revisit, along with a few new insights. Especially since there’s a mixture of logic and pure FUD on both sides. Neither the government nor any of the technology giants have avoided looking like the bad guy at some point in our tech history. Remember when Microsoft was seen as the “Evil Empire” because they were, at the time, too successful? How about all the worry about Google gathering info on all of us? And fanboys on all sides throwing accusations at anyone not their fave. This particular battle has almost become like that. Or at least like two bullies facing off in the schoolyard. Neither really throwing a real punch, afraid they’ll lose face if it turns into a real fight and they lose. This, of course, was immediately attacked by Apple as the government’s plan, no matter what, and a major example of government overreach. There is a parallel in the 2013 case against Edward Snowden, involving Ladar Levison and his encrypted email company, Lavabit. He too was compelled by the government to provide “technical assistance” to help the FBI install a pen register device to obtain metadata on an Lavabit account — thought to be Snowden’s but that was never formally confirmed as the case remains under seal. Levison forcibly shut down his encrypted email service after federal agents later demanded that he turn over his master encryption key, which he said would give agents access to every one of his customers’ data. “It’s rather disturbing that the government is relying on the authority they obtained by railroading a small business in a secret court proceeding to justify demanding the key from Apple now,” he said. The initial filing was narrow in its requested custom code, tied specifically to the terrorist’s specific iPhone 5c only, created and used in an Apple facility, with a provision that Apple would be free to destroy the software tool after use. Perhaps far less invasive than both sides are publicly communicating. To hear Apple tell it, the creation of a “backdoor” to the iPhone owned by San Bernardino shooter Syed Rizwan Farook, propped open however briefly, would imperil the very concept of privacy, not to mention millions of iPhones around the globe. As a principle and a moral argument, this view has been embraced by Silicon Valley and much of the privacy community. And yet on the separate technical question of whether Apple could safely break this one phone without unleashing havoc on the privacy world, there is consensus: yes, Apple can, even if it won’t. If we look at Apple’s general situation, there’s another element that may come into play. Apple has had several quarters of diminishing sales and decreasing profits. I won’t say that this is driving Tim Cook’s stance. But any company’s executives have a primary responsibility to the enterprise’s board and stockholders. That usually focuses on profitability. It would surprise me that this didn’t at least hold some sway with Tim Cook’s decision making. If Apple is struggling a little more, no one involved with Apple would happily do anything that could further alienate the buying public. It’s been suggested that present day search and seizure law hasn’t kept up with the extra twists and turns that technology has added to what we need pay attention to. That’s probably true. But the laws regarding search and seizure started at one point and were corrected over time, without a lot of abuse occurring. Yes, we need laws to cover tech searches. But should we wait till there’s a full set of laws in place? Personally, I’m wondering if we haven’t created much of this mess through our own present day attitudes. We have a House and Senate that aren’t passing any legislation to make this easier. They’re so busy being Republicans and Democrats that I think they’ve forgotten about being Americans. And our presidential candidates spend more time denigrating each other than actually talking about issues. We’re so obsessed with our own views that there’s no thought of real discussion and compromise. Which leads to seeing pictures like one I saw a few days ago on Facebook — two young children at the front of a protest, with a sign that had the words “**** Trump.” I blanked the main word there, because it’s one that those kids shouldn’t have seen, much less known. And assaulting a reader’s sensibilities is not my idea of free speech. It doesn’t matter who or what we’re for or against, is it really more important than our fellow Americans or our fellow man? It hurts me to see people so entrenched in their thinking that it doesn’t matter if it hurts those who oppose it. Does it make sense that those who understand that black lives do matter would be upset when someone suggests that all lives matter? I understand Apple’s hesitance at giving carte blanche to the government. We need to protect our freedoms and privacy. But at what cost? The longer we delay may give the enemy too much time to change things, making the info on that one phone (if any) mostly useless. Beyond that, there’s a chilling reality. The more we point fingers at each other and place blame elsewhere, the less likely we’ll have real advances in equality and helping each other. Have we forgotten that much of our success has come through useful compromise? And that we can’t work together if we refuse to talk to each other and understand each other’s thinking?